Disneyland’s long been the happiest place on Earth for kids—soon it will be for parents as well. Ballast Point Brewing Company announced yesterday it will operate Disney’s first on-site brewery, located in the Anaheim, California theme park’s Downtown Disneyland area (you don’t need a ticket to access this part of the Disneyland complex). A 7,000-square foot restaurant, beer garden, and small-scale brewery are expected to open there late this year. Renderings show an open-air restaurant with bar and table seating. San Diego-based Ballast Point made headlines in 2015 when it sold for $1 billion to Constellation Brands, an alcohol company that also owns Corona, High West, Modelo, Svedka, and other brands. With that kind of financial backing, Ballast Point has been able to swiftly expand its reach outside of its home state. 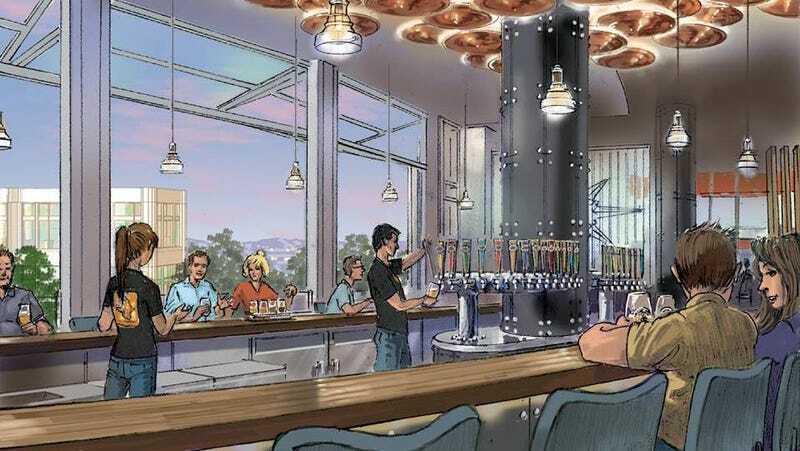 The brewery now has a production facility outside Roanoke, Virginia; an official sponsorship with the Barclays Center in Brooklyn, New York; and plans for a Chicago brewpub to open later this year. Ballast Point is known for IPAs, especially its flagship Sculpin and riffs like Grapefruit Sculpin and Pineapple Sculpin. A statement from Constellation Brands promises the Anaheim location will serve those as well small-batch, made-on-site beers exclusive to the Disney spot. While Ballast Point perhaps lost some indie cred among beer geeks when it sold to Constellation, that company’s financial backing has allowed the brewery to go from cult California darling to more mainstream national visibility. Breweries in general are more ubiquitous than ever, popping up inside stadiums, airports, and logically, theme parks. For years, most brewpubs have cultivated a family-friendly atmosphere with kids’ menus, designated play areas, and root beer on tap for the under-21 set. In 2018, offering exhausted parents a pint while they’re neck-deep in Mouse-land doesn’t seem that far of a stretch.